Woman to Woman: He is talking...do you hear? He is talking...do you hear? "Be still, and know that I am God!" 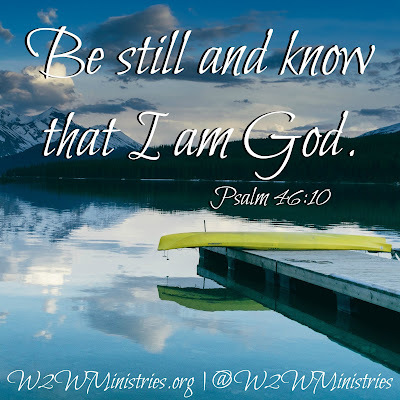 That sounds simple enough..."Be still, and know that I am God! "...but the reality of it is, it's not easy being still. We are a people on the move. We are living in a world that is 90+ miles an hour and to take time out to 'be still' just doesn't seem possible most of the time. I think of 'being still' like this...God created the world in 6 days and on day 7 He rested. We are supposed to rest...work all week, take a day off. In this fast paced world we live in, we need to take time to just 'be still' before the Lord. How can we hear Him talk to us, to feel His arms wrapped around us. When we have a conversation with a friend, we don't talk non-stop, at the same time they do. No, we talk, then they talk...we talk, then they talk. We stop and listen to what they are saying It's this same with God. We are supposed to take our petitions to Him but we have to stop talking at some point so we can hear what He has to say to us. God DOES talk to us...in a gentle breeze, the song of the bird, the rustle of the leaves, sometimes in a whisper in our heart, sometimes in an audible voice. We will never hear Him speak if we don't close our own mouth and wait on Him. Today I encourage you to take a few minutes and just sit before Him. Don't ask for anything. Don't talk...just listen. You might be surprised at what you hear!